San Paolo Fuori le Mura was erected in the 4th century. 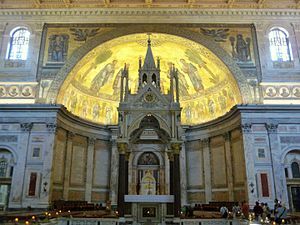 It is one of the four patriarchal basilicas of Rome built at the request of Roman Emperor Constantine I over the burial place of Paul the Apostle. 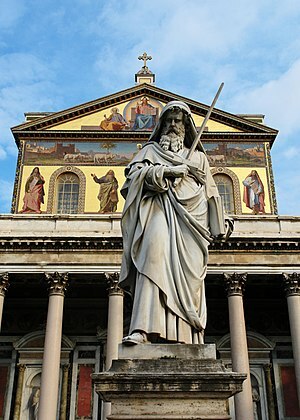 Saint Paul Outside the Walls is sometimes called the “Basilica Ostiense” because it is located on the Ostian Way. 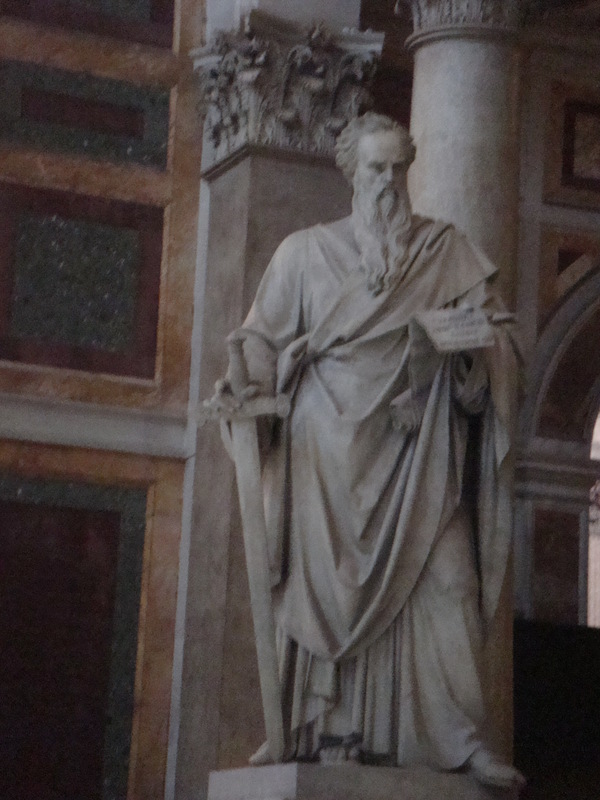 Paul the Apostle was brought to Rome as a prisioner. 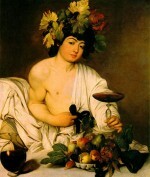 He was martyred between the years 64 and 67, during the persecution of Emperor Nero. 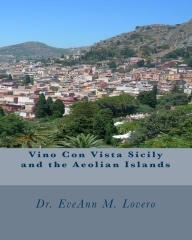 His body was claimed by a Roman woman who buried it in her family tomb near a vineyard on the road to Ostia. Emperor Constantine placed the Apostle’s body in a bronze sarcophagus with a marble slab over it. 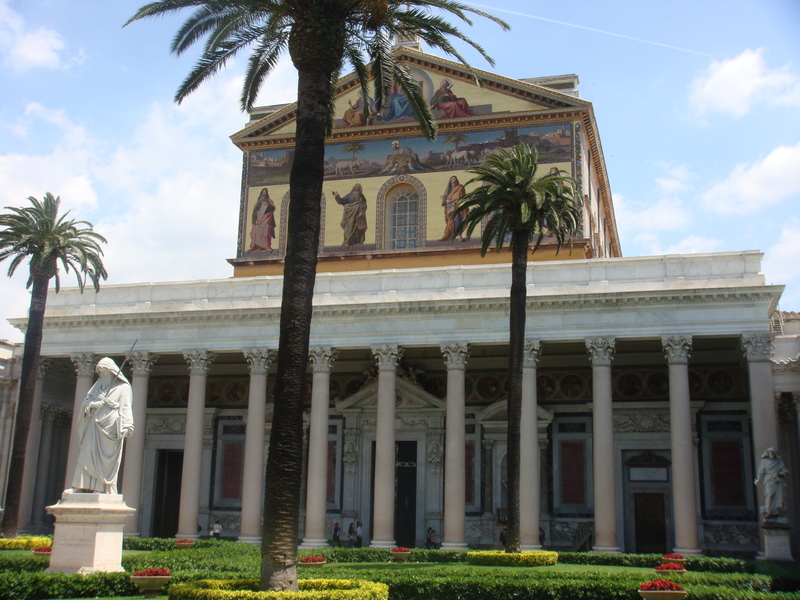 At the request of Emperor Constantine in 324, a basilica was built over St. Paul’s tomb. 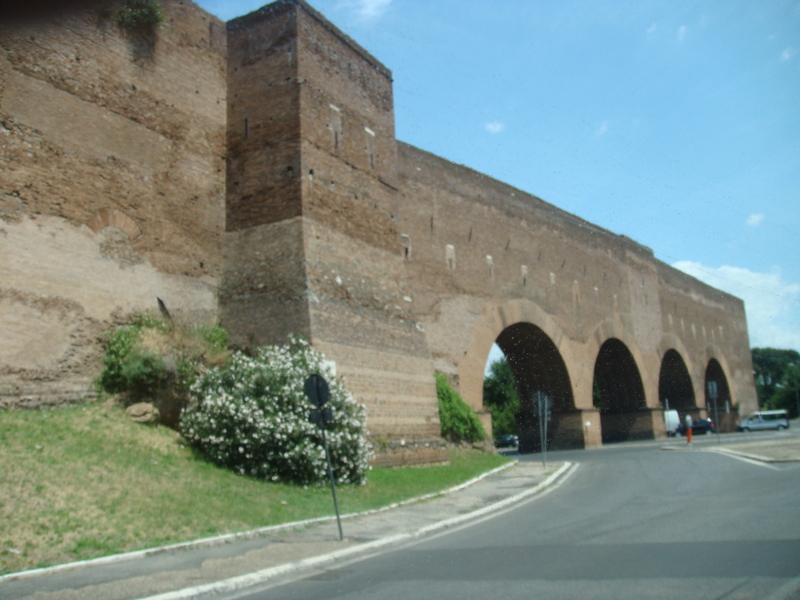 This first edifice was expanded under Valentinian I in about 370. Since many pilgrims came to visit the site, Emperor Valentine II made plans for a larger building. Emperor Theodosius began the new building and Emperor Honorius completed it. Pope Leo III, further embellished the building and it became the largest and most beautiful church in Rome under his papacy. 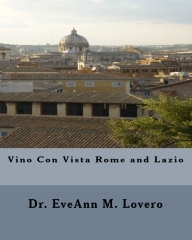 Of all the churches of Rome, this one preserved its primitive character for 1435 years. In 1823 it was almost completely destroyed by a fire. 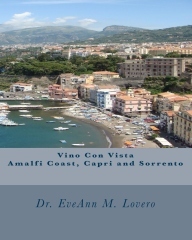 In 1823, it was rebuilt and enlarged by the architect Poletti and modified by Guglielmo Calderini. It was completed in 1854. The interior of the current basilica has 80 monolithic columns of Montorfano granite divided into five naves. 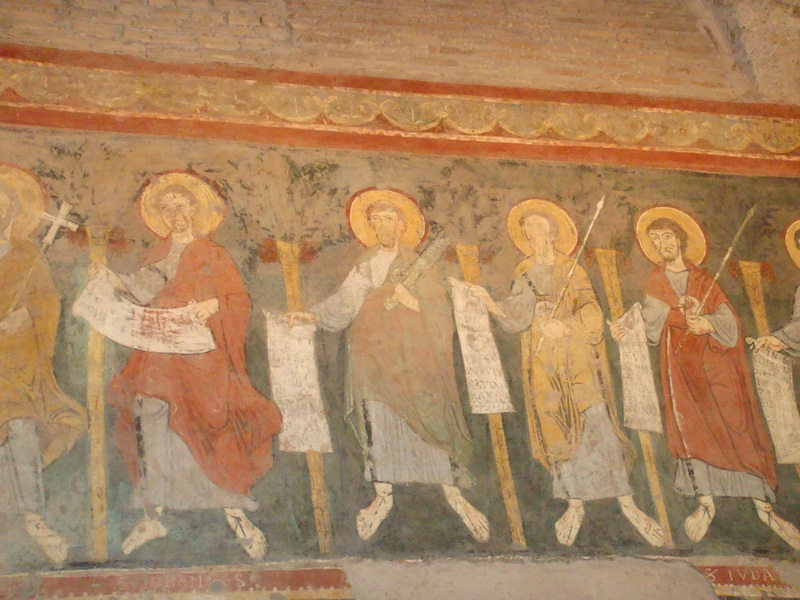 On the upper part of the walls, frescoes illustrate scenes from the life of St Paul. Against the internal wall of the facade there are six large alabaster columns presented by the Viceroy of Egypt to Gregory XVI. 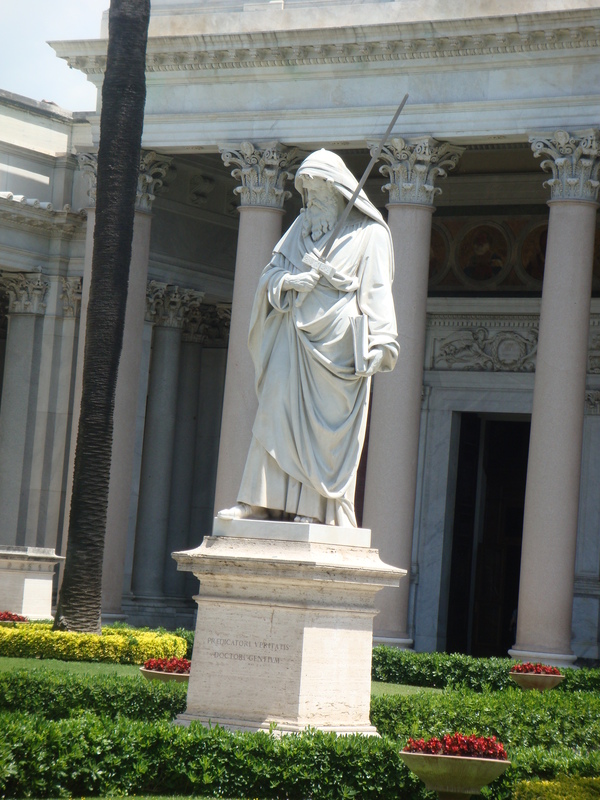 Saint Paul Outside the Walls is located at the site where Paul was executed and buried. 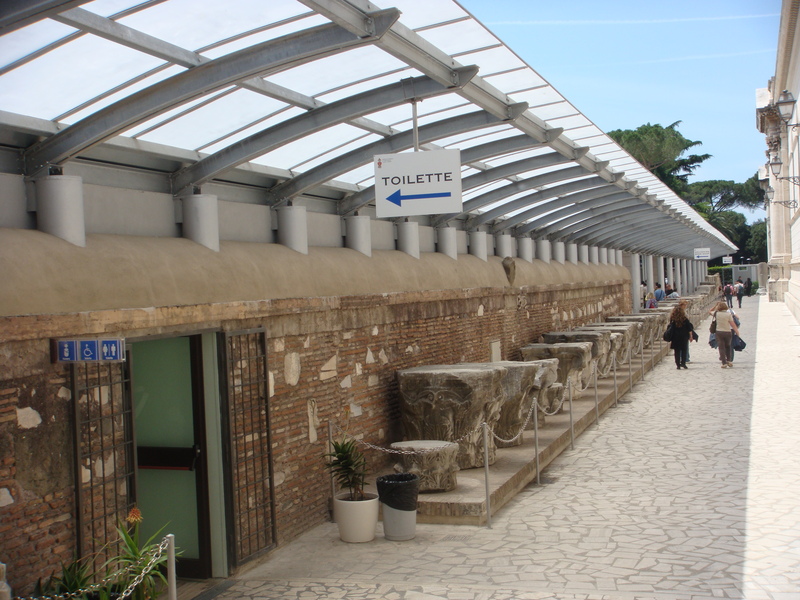 It is located outside the Aurelian Walls. 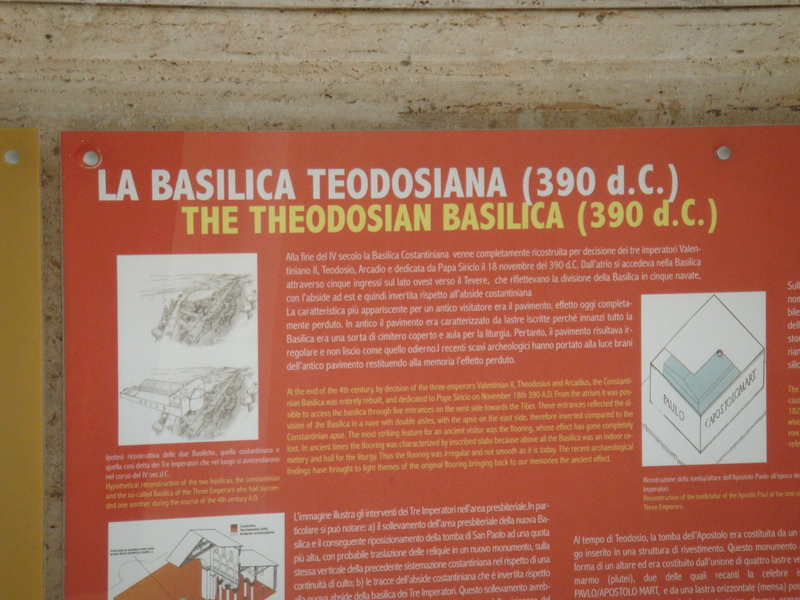 The the basilica was damaged during the Saracen invasions in the 9th century. 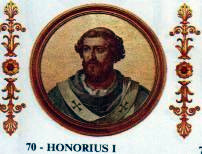 Pope John VIII (872–882) fortified the basilica and the monastery forming the town of Joannispolis (Giovannipoli) which existed until 1348, when an earthquake totally destroyed the town. 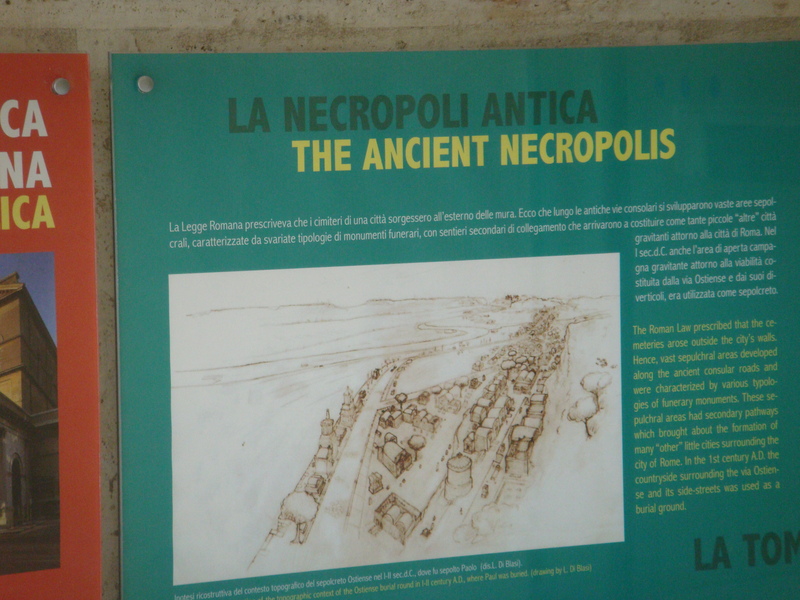 The Basilica was founded where his followers erected a memorial, called a cella memoriae. 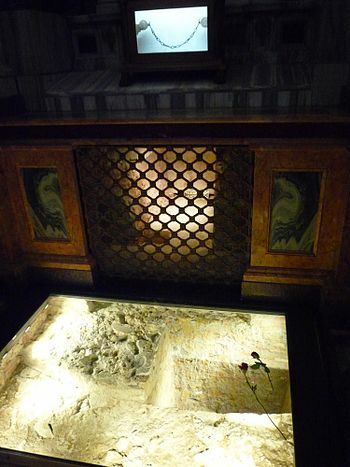 In the chapel of the relics, lie the chains that bound Paul the Apostle when he was improsioned in Rome. 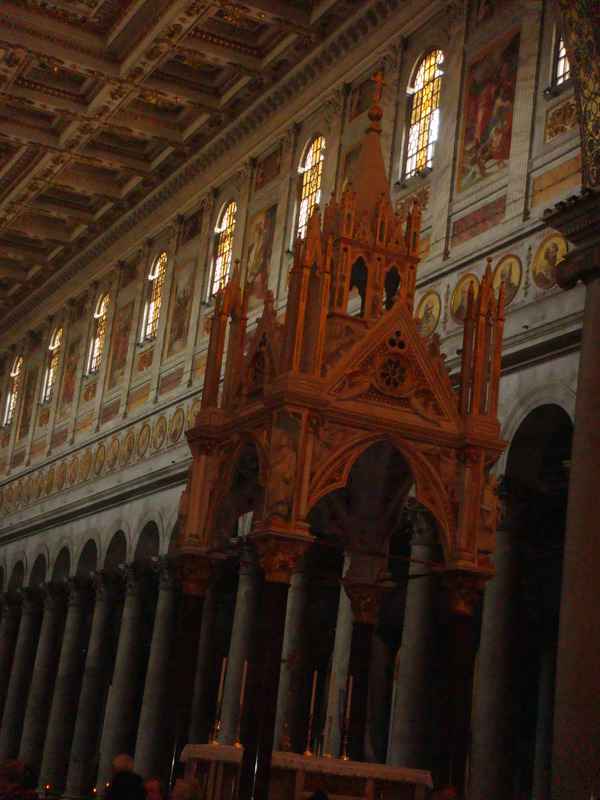 In the 5th century, this church was larger than the Old St. Peter’s Basilica. 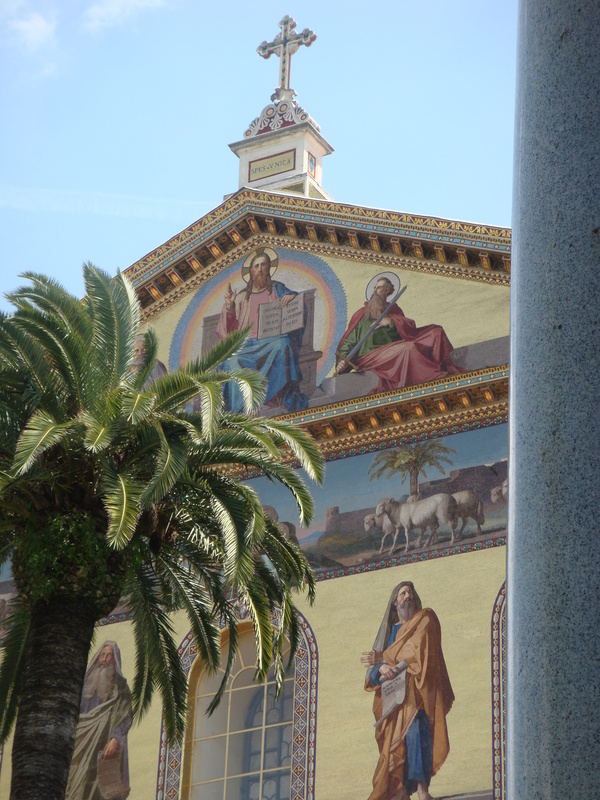 The front of the basilica has ten monolithic columns of red Baveno granite. 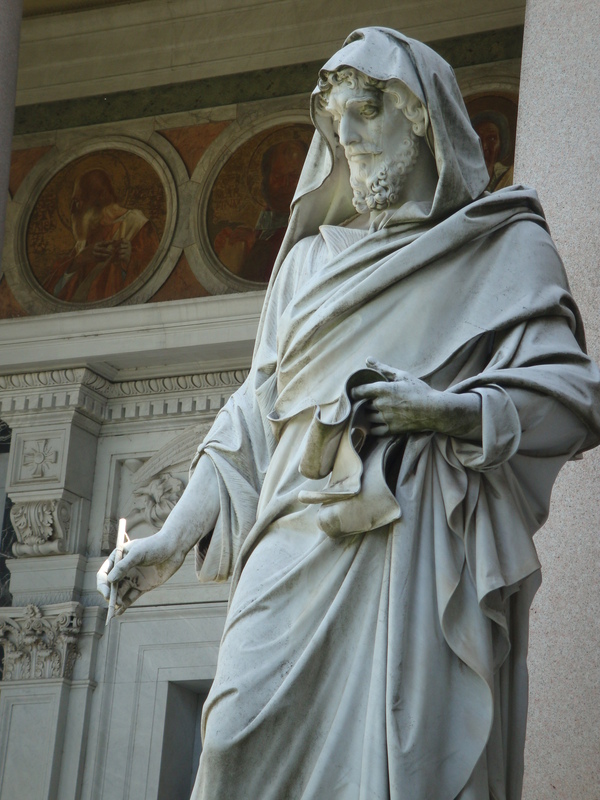 A huge statue of St. Paul dominates the entrance to the new building. The inscription on the base of the statue says “To the preacher of truth, the teacher of nations”. 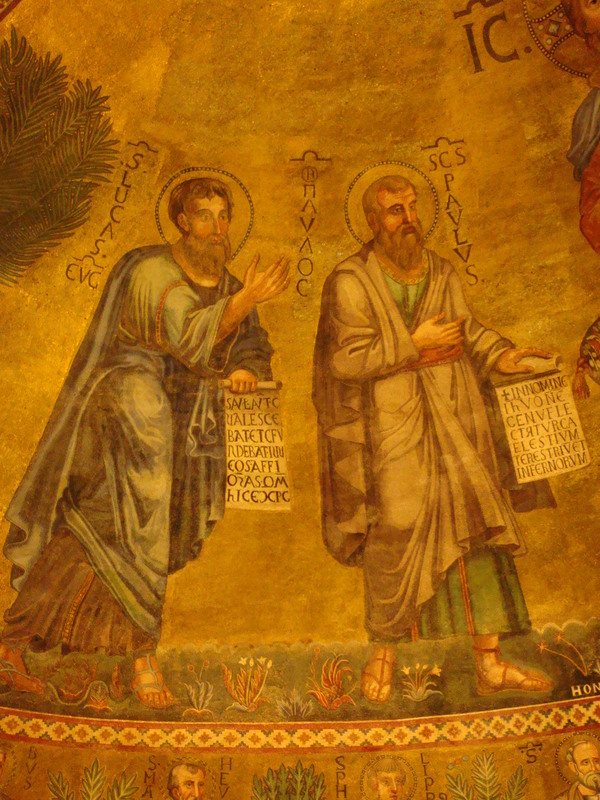 The facade mosaic is the work of Filippo Agricola and Nicola Consoni. 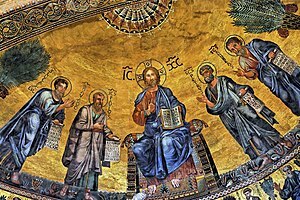 In the typanum, Christ is seated in the center giving his blessing. 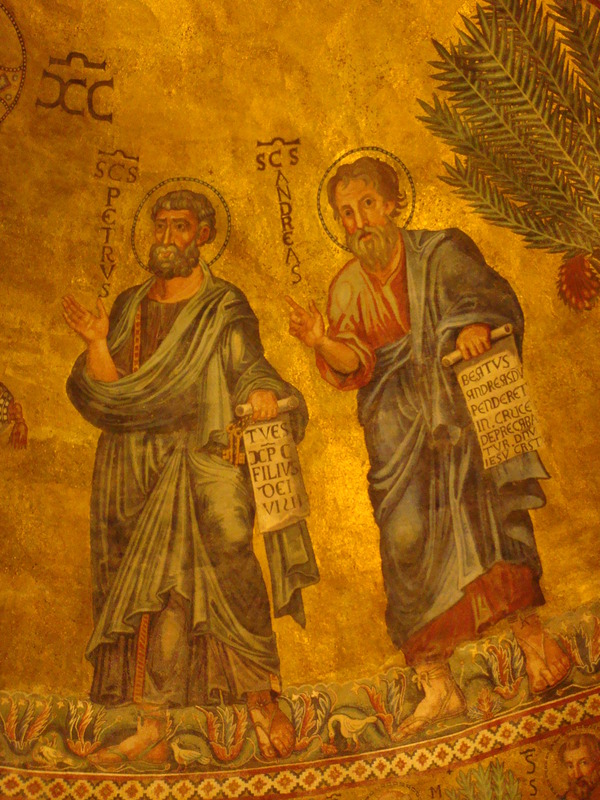 On his right side is Saint Peter and on his left side is St. Paul. Below the Lamb of God, the four rivers of Paradise flow. Twelve sheep represent the Apostles who approach the Lamb from the holy cities of Bethlehem and Jerusalem. 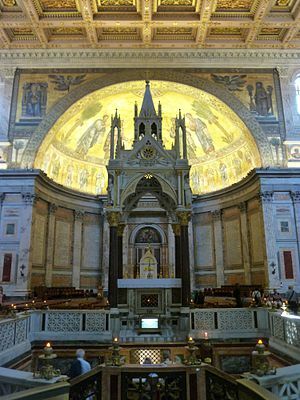 It was rebuilt by the architect Poletti and reconsecrated 1855 with the presence of Pope Pius IX and fifty cardinals. Many countries made contributions to the reconstruction efforts: the Viceroy of Egypt sent pillars of alabaster, the Emperor of Russia sent precious malachite and lapis lazuli for the tabernacle. In the right corner there is a statue of St. Luke the Evangelist. 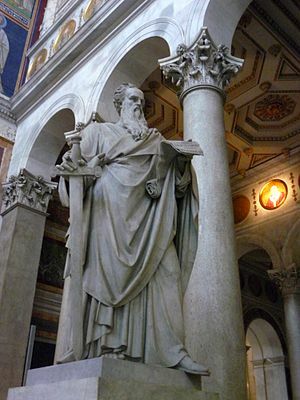 Saint Paul is in the front of the basilica. 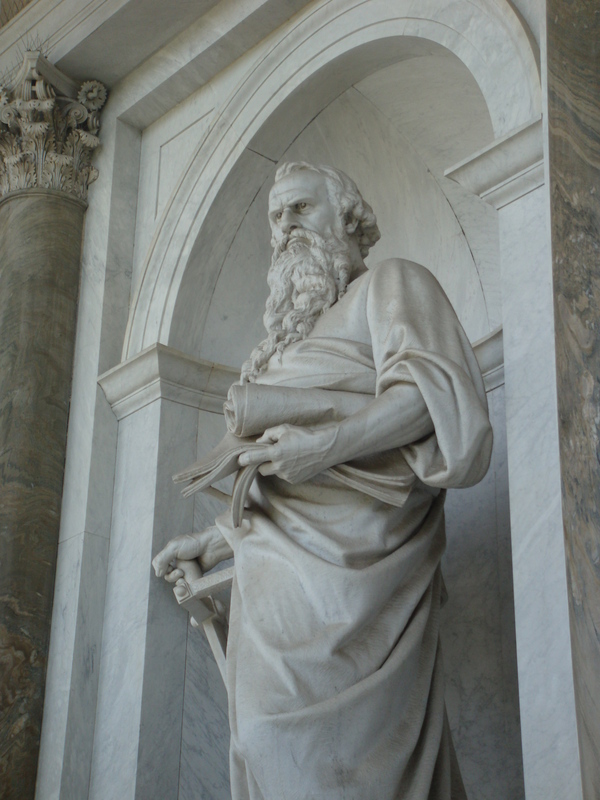 Under the portico, the wall niches have statues of St. Peter and St. Paul by Gregorio Zappala. Popes Leo XII, Pius VIII and Gregory XVI, personally oversaw the reconstruction of the church. 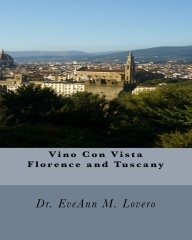 In 1854 Pope Pius IX was able to celebrate the completion of the reconstruction. 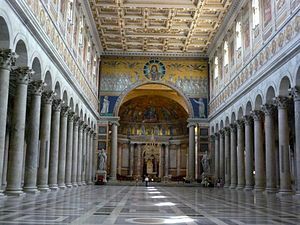 Under Pope Gregory the Great (590–604), the basilica was extensively modified. 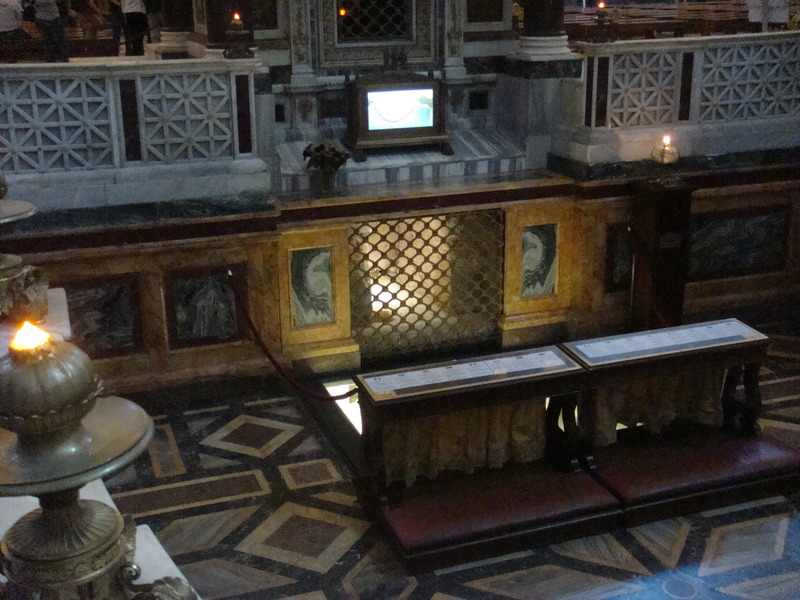 He had the pavement was raised to place the altar directly over Paul’s tomb. The tomb is covered by a Gothic baldachino by Adolfo di Cambio completed in 1285. 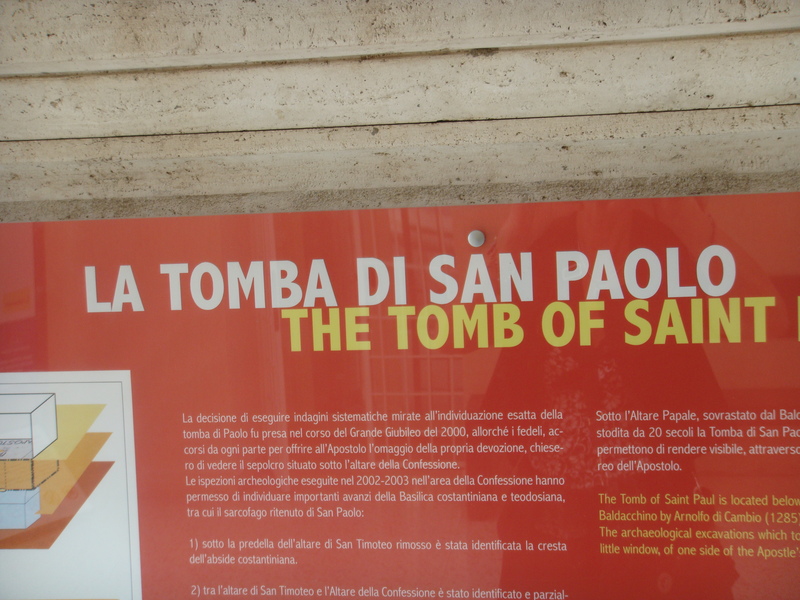 Here’s a virtual tour of St. Paul’s Tomb http://www.vatican.va/various/basiliche/san_paolo/vr_tour/Media/VR/St_Paul_Tomb/index.html. To make a portion of the tomb visible to religious pilgrims, the floor was lowered forming a confessio where people can pray. Directly below the altar, a grill-covered window reveals the stone sarcophagus. Carbon dating of the contents of the tomb indicated that the remains in the sarcophagus are from someone who lived in the first or second century indicating that they are the remains of the apostle. 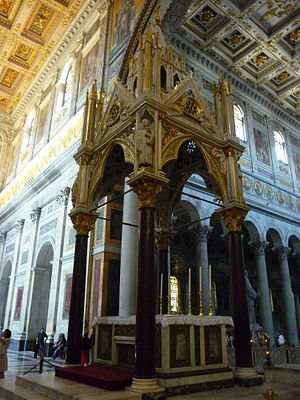 Over Saint Paul’s tomb, Arnolfo di Cambio‘s Gothic tabernacle is resting on four porphyry columns. 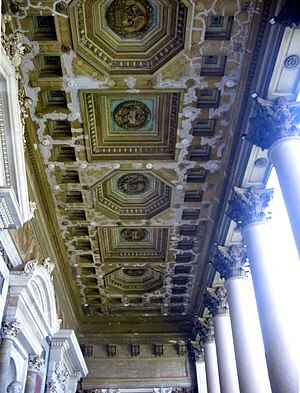 The four cornices above the niches of the baldachin have statues of Saint Peter, Saint Paul, Saint Timothy and Saint Bartholomew. Excavations located a first century tomb with a marble slab covering it with the Latin inscription “Paulo Apostolo Mart”. You can see a plaster copy of the slab in the Church Museum located off of the cloister. 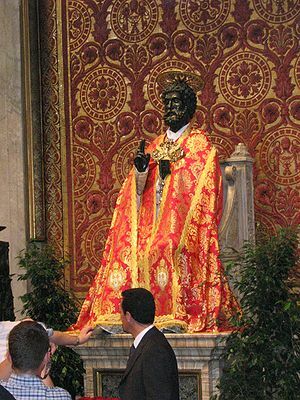 Arnolfo di Cambio also created the bronze Saint Peter statue in St. Peter’s Basillica and the ptesepe in the lower level of Santa Maria Maggiore. San Paolo Fuori le Mura’s interior has 80 monolithic columns of Montorfano granite from the isolated mountain on Lake Maggiore. It is divided into five naves. Above the arches over the granite columns, all the way around the interior of the Basilica, there are circular mosaic portraits of all the Popes, from the first to the present. Only the current pope’s portrait is illuminated. According to legend, when this Basilica runs out of space for these portraits of the popes, the world will end. On the upper part of the walls, between the large windows, there are 36 frescoes with the scenes from the life of St Paul. Against the internal wall of the facade there are six large alabaster columns presented by the Viceroy of Egypt to Gregory XVI. The palm trees represent paradise. 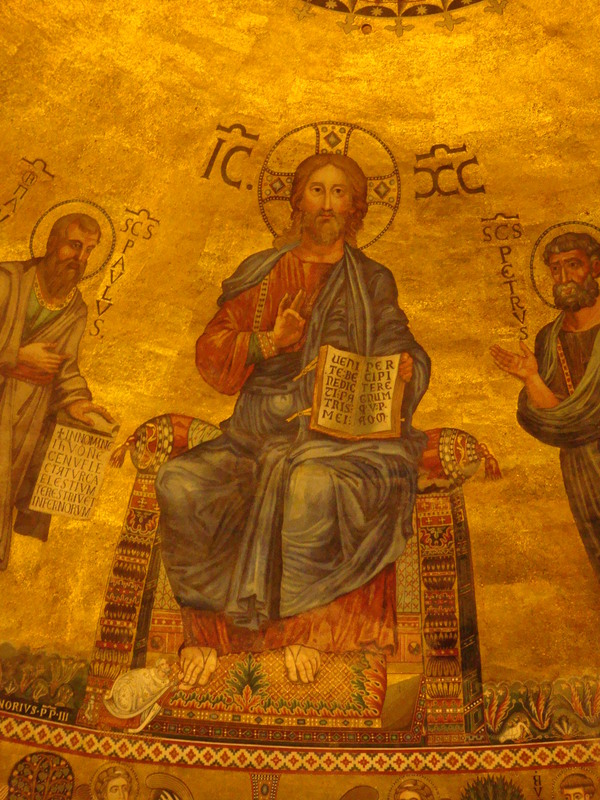 The papal chair has a relief of Christ instucting Peter to feed the sheep. 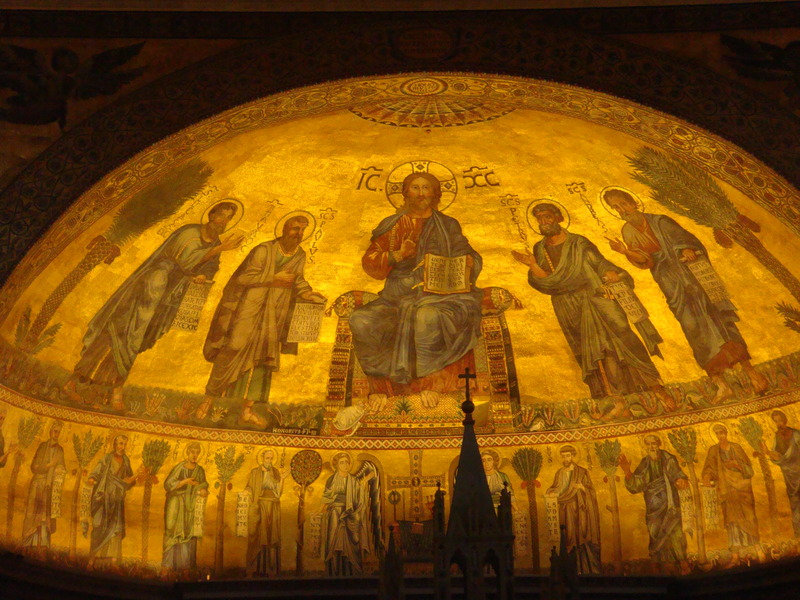 You can see Hononius III at the foot of Jesus is the apse mosaic. The graceful cloister of the monastery was erected between 1220 and 1241. 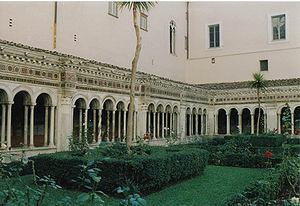 The spiral columns of the cloister were built by the Vassalletto family in 1214 and survived the fire. From 1215 until 1964 this was the seat of the Latin Patriarch of Alexandria. 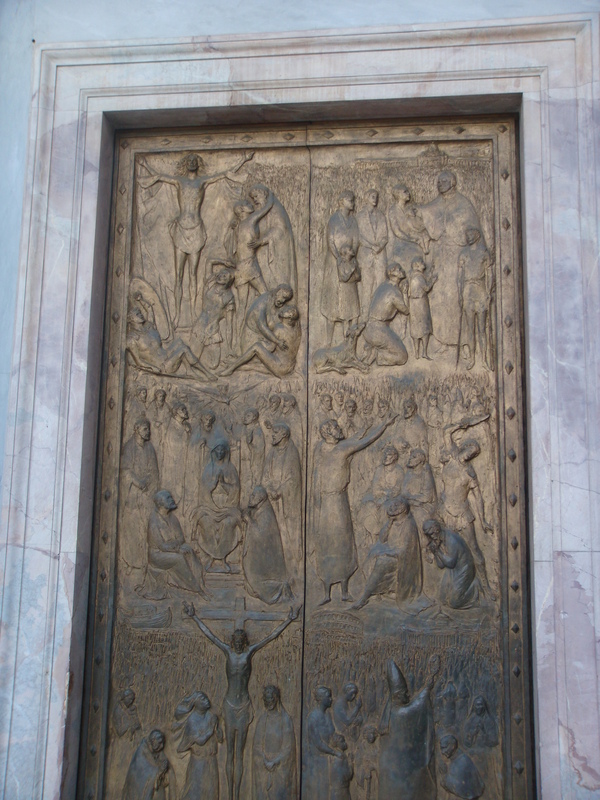 The Holy Door was last opened in 2000 and there is a large plaque above the door commemorating the event. The door pictured below on the right, is the work of Antonia Maraini and was cast in Florence in 1931. 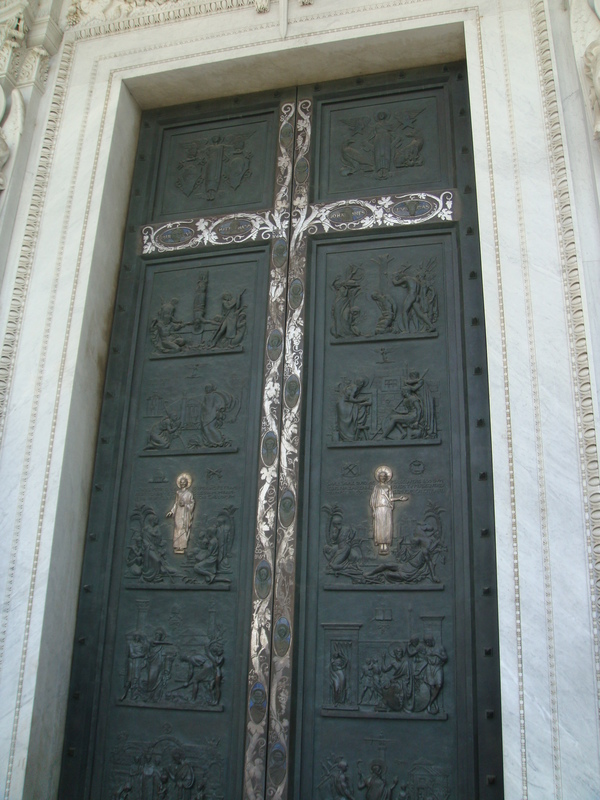 The cross on the bronze door is highlighted in silver and the horizontal bar bears the names of the evangelists. The verticle potion of the cross, has portraits of the Apolstles. 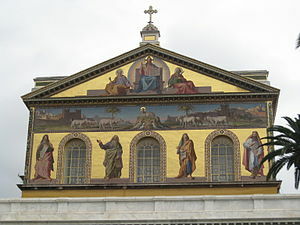 The panels on the door depict scenes from the life of Saint Peter on the left and Saint Paul on the right. 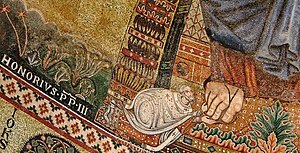 The figure of Christ shows him giving the keys to Saint Peter. 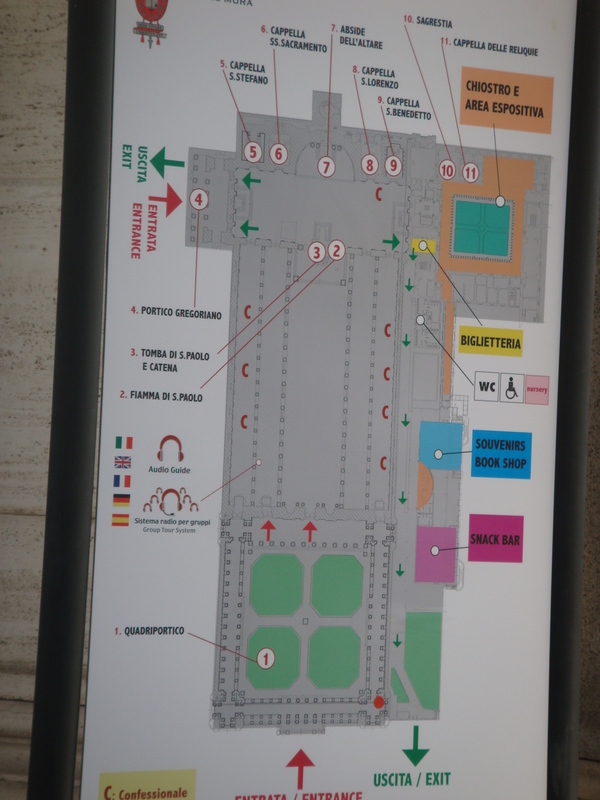 Visit the Pinocoteca with “Flagellation” by Bramante and other interesting works of art and tour the interesting Museum http://www.vatican.va/various/basiliche/san_paolo/vr_tour/Media/VR/St_Paul_Museum/index.html. 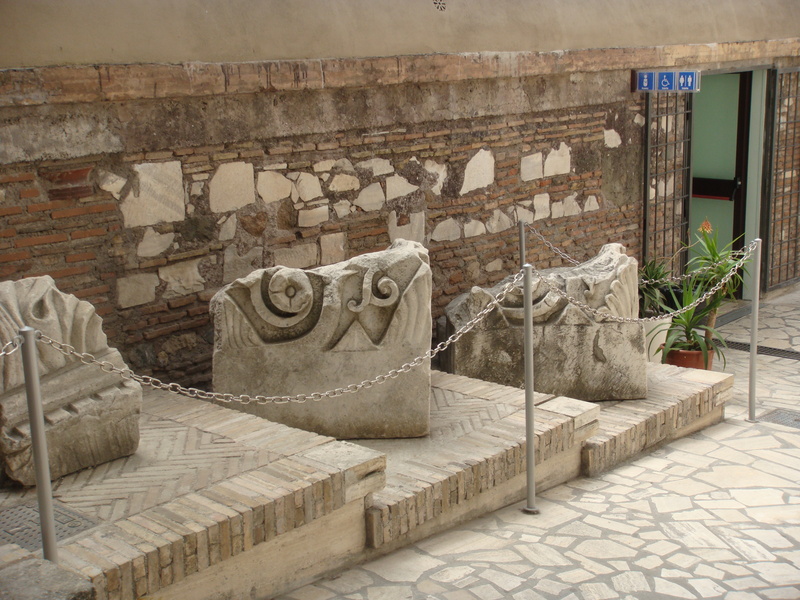 See some of the fragments of the original basilica. 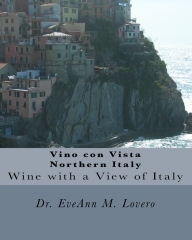 Then stop at the where you can enjoy a Vino con Vista.